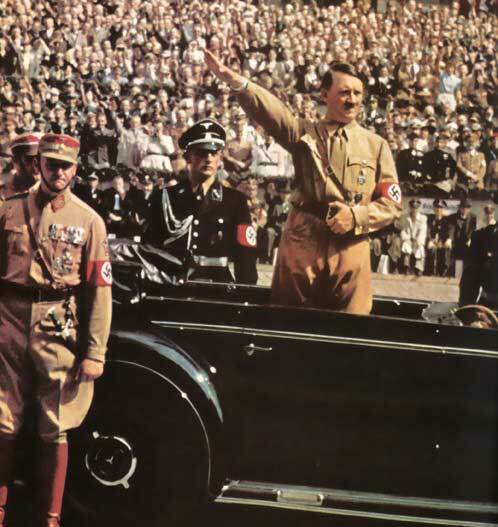 INFORMATION ON ABOVE PHOTOGRAPH: THE FUHRER WORKS THE CROWDS: Photograph taken as the Fuhrer salutes the crowd in Adolf Hitler Platz during the Nuremberg Reich's Party Congress in 1938. The complete photograph I have shows his Party Secretary Rudolf Hess standing to the right of the unidentified SA(Sturm Abeilung or brownshirt)not shown in ww2db file photo, other brownshirts are standing with Hitler's SS Security detail. Oops...misspelled the word know, starting with did you know. UNIFORMS OF FEAR AND TERROR: The Black SS uniform made its appearence in 1932, its SS runes, death head skull and cross bones, Nazi Party Armband, became the most recognized uniform of the 20th Century. It became a symbol of fear and terror, the Black SS uniform was worn up to the start of WWII, SS troops later used standard field gray Wehrmacht uniforms. Ranks remained the same throughout WWII. Did you know some unknown clerk, who's job was to shorten letter heads created the name Gestapo from Geheime Staatspolizei (Secret State Police) The Waffen-SS became the Military arm of the Nazi Party. CODE WORD: AKTION T-4 (ACTION) NOTHING PERSONAL ITS JUST BUSINESS Code word for the murder of the mentally ill, the handicapped, sick, crippled, people with physical disabilities, incurable mental health problems, adults, babies and children with birth defects. Imagine being part of such mass murder did you know most of those in the SS were university educated or in professional vocations, all of them were just criminals. At wars end how many really escaped justice... PREDATORS: The WWII German company doing business as Deutsche Geseuschaft fur Schadlingsbekampfung manufactured the gas ZYKLON B this gas was used to murder Jews and others in the gas chambers. Today its doing business as Delta Degesch GmbH in Germany. After WWII several employees of the company that supplied ZYKON B were arrested and tried in criminal court. Bruno Tesch owner of Tesch & Stabenow were tried before British court in 1946 these men were found guilty and condemned to death in May 1946. DARK HISTORY: Thousands of German companies supplied the Third Reich with whatever it needed. People knew what was going on you can't keep whole sale murder a secret. Did you know this gas was named CYANOL in West Germany and CYANOSIL in East Germany it is used as an insecticide. Did you know the phrase "ARBEIT MACHT FRIE" Work Will Set You Free wasn't invented by the Nazis, its an old German present saying that was placed above the gates of Auschwitz in reality people were worked to death and murdered. SECRETS: NO EYE WITNESS Did you know Jews named Sonderkommando buried the dead in the death camps. They also burned the bodies in the ovens, because the Nazis didn't want to do it themselves. These people were later murdered themselves as the Nazis didn't want any witnesses, However about twenty survived out of thousands used to do such dirty work. Did you know that thirty two countries offered to transport the Jews out of Europe. To read the facts about what really happened, are shocking! HOLOCAUST: GREEK Holo = Whole and Kaustos = Burn MOVIES OF INTEREST: Schindler's List - DVD Holocaust - DVD The Plot to Kill Hitler - DVD Operation Valkyrie - DVD Conspiracy - DVD Hitler The Rise Of Evil - DVD The Scarlet and the Black - DVD The Monuments Men - DVD I thank the editor/ww2db for his continued support for allowing me to continue our study of Adolf Hitler and the Third Reich. All comments are personal opinions, experiences or based on historical fact and do not reflect the editor/ww2db in any way. OOPS! made an error in my spelling the word should read as an old German Peasant Saying ARBEIT MACHT FREI "WORK SETS YOU FREE" PEASANT: Traditional class of farmer, labor, poor or owners of small farms, low social class.